An SGH study published online last month in the Singapore Medical Journal has found that those who learn a simplified form of cardiopulmonary resuscitation (CPR) can better remember what they have learnt and are arguably more effective in saving lives. 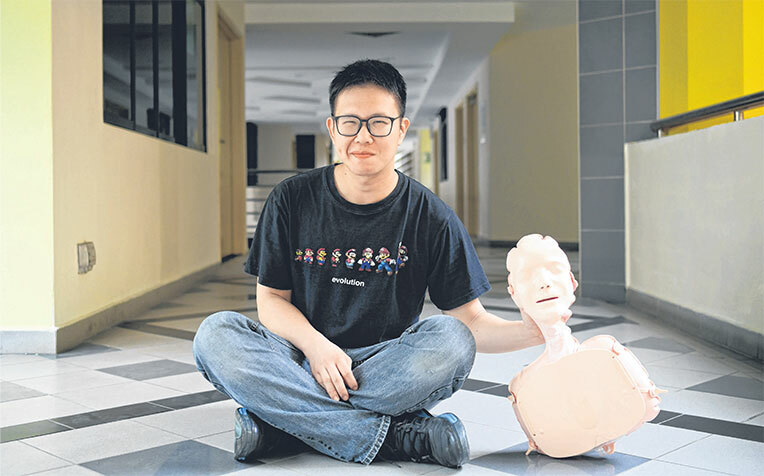  CPR instructor Billy Lim with an inflatable manikin used for practising cardiopulmonary resuscitation (CPR). Knowing simplified CPR enabled Mr Lim to save the life of a cardiac arrest victim last month. He took turns with another bystander to perform CPR until an ambulance arrived. Squeamish about giving mouth-tomouth resuscitation? The good news is you can help revive someone without doing so, in a way that may even be more effective. A local study has found that those who learn a simplified form of cardiopulmonary resuscitation (CPR) can better remember what they have learnt and are arguably more effective in saving lives. This simplified CPR omits mouth-to-mouth resuscitation. Instead, the focus is on carrying out continuous chest compressions. The pared-down version of CPR, which can be taught in one hour compared with the four-hour standard version, also teaches a simpler way of locating where to apply the chest compressions. “Mouth-to-mouth ventilation is technically more difficult than chest compressions, and some people don’t like to do it because of hygiene reasons,” said Associate Professor Lim Swee Han, the study’s lead researcher. This could explain why 13 of the 33 participants who learnt standard CPR did not perform mouth to- mouth resuscitation when they were tested on their skills two months later, added Prof Lim, a senior consultant at Singapore General Hospital’s (SGH) department of emergency medicine. Even among those who did, more than half inflated the lungs with either too much or too little air. The study, conducted from November 2013 to January 2014, involved 77 participants who had not learnt CPR in the last two years. They were split into two groups – one learning standard CPR and the other, simplified CPR. The study was published online last month in the Singapore Medical Journal. Prof Lim said that in cases where a heart attack causes the heart to beat with a chaotic rhythm and stop pumping blood effectively, “the impact (of mouth-to-mouth resuscitation) on survival is less” compared with chest compressions. During the first few minutes of a cardiac arrest, a fair amount of oxygen is still in the blood and there is more urgency to get the heart pumping properly again, he added. More people have been trained in the simplified version of CPR. Many were trained through the Dispatcher Assisted first Responder (Dare) programme piloted in 2014. Under Dare, participants learn to respond to an emergency by checking if the victim is responsive, calling 995 and staying on the line with a medical dispatcher to perform CPR and use an automated external defibrillator (AED) as directed. A total of 71,000 people have learnt simplified CPR since the launch of Dare in 2014. In August, it was made compulsory for all Secondary 1 students to learn simplified CPR, under the Dare programme by the Health Ministry’s Unit for Pre-hospital Emergency Care (Upec). This comes under the SGSecure movement and Community Emergency Preparedness Programme, which aims to teach the public life-saving skills and emergency procedures. Research shows that a cardiac arrest victim’s chances of survival drops by about 10 per cent for every minute without intervention. Knowing simplified CPR enabled full-time CPR instructor Billy Lim, 32, to save a life last month. He was going home when he was alerted via the myResponder app of a case of cardiac arrest at Hong Kah North Community Centre in Bukit Batok. “At that point of time, I didn’t think of anything except using my knowledge to provide assistance,” said Mr Lim, who took turns with another bystander to perform CPR until an ambulance arrived. Still, Associate Professor Marcus Ong, clinical director of Upec, warned that learning simplified CPR is not enough and one needs to upgrade one’s life-saving skills. Prof Ong, also a senior consultant at SGH’s department of emergency medicine, said simplified CPR is “a great first step” but does not cover mouth-to-mouth resuscitation, which is important for victims who suffer cardiac arrest during swimming and are drowning. The Straits Times, Singapore Press Holdings Limited. Reproduced with permission.